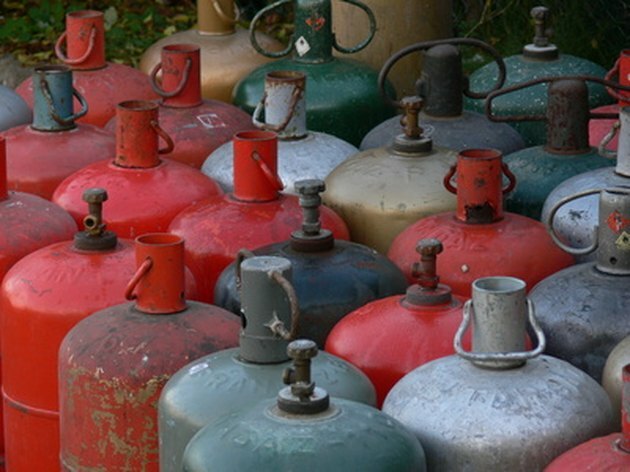 It's important to know the age of your propane tank, because propane tanks must be requalified within 12 years of their manufacture date in order to be refilled. If you are not the original owner of the propane tank or can't remember when you bought it, do not worry. All propane tanks and cylinders are stamped with their manufacture date, you just need to know where to look for it and how to read it. Locate the collar of your propane tank. The collar is the raised piece of metal at the top of the tank, surrounding the valve. On the bottom half of the collar, look for the letters "MFG DATE." This indicates the manufacturing date. Locate four numbers with a space between the second and third numbers directly beneath the letters "MFG DATE." The first two numbers represent the month the propane tank was manufactured. The second two numbers represent the year the propane tank was manufactured in. Subtract the year that the propane tank was manufactured from the current year to determine the age of your propane tank.